Julian Cooper at Art Space Gallery | Michael Richardson Contemporary Art London UK. 1981 Resident at the Virginia Centre for Creative Arts, U.S.A.
1976 Resident at the Karolyi Foundation, France. 1970 Elected Member of the London Group. 1969 Awarded Boise Travelling Scholarship. Travelled in Europe and resided British School at Rome. 2009 MOTHER LODE Carrara and Cumbria Quarries, Brantwood, Coniston, Cumbria. 2001 Mind Has Mountains, 3 Degrees West Gallery, Wordsworth Trust. 2001 Julian Cooper Paintings Brewery arts Center, Kendal. 1998 Figure and Landscape Art Space Gallery, London. 1997 Ambleside Mountain Festival, Ambleside. 1996 The Mountain Looks at You, Tullie House Museum, Carlisle. 1995 Lawrence Batley Gallery, Bretton Hall, Yorkshire. 1994 Stanley Corridor Gallery, Leeds General Hospital. 1990 International Mountain Literature Festival, Bretton Hall, Yorkshire. 1984 Two Man Show (with Terence Clarke), Paton Gallery, London. 1983 Summer Show Two, Serpentine Galley, London. 1978 J.PL Fine Art London. 1974 Summer Show One, Serpentine Galley, London. 1974 Laing Art Gallery, Newcastle upon Tyne. 1973 Trevelyan College, Durham University. 1972 Greenwich Theatre Gallery, London. 1971-72 Zella Nine Gallery, London. 1999 Climbing Art, Brewery Art Centre, Kendal. 1999 Contemporary British Landscape Painting, Flowers East, London. 1999 Mountain, Wolverhampton Art Gallery. 1998 Winter Journey, Art Space Gallery, London. 1994-92 Carlisle Open Exhibition, Tullie House Art Gallery. 1990-88 Clean Irish Sea, City Centre, Dublin & touring. 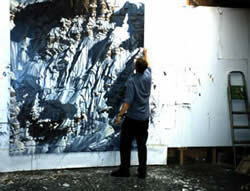 1990-88 Artists in-National Parks", Victoria & Albert Museum & touring exhibition. 1989-87 The Day Book, Smith's Gallery, London & touring. 1988 From lcarus to Ariadne, Paton Gallery, London. 1986 Group Show, Paton Gallery London. 1985 Group Show, Paton Gallery London. 1983 Summer Show Two, Serpentine Gallery, London. 1979 Three Generations, Abbott Hall Art Gallery, Kendal. 1978 Northern Art Open, Shipley Art Gallery Gateshead. 1977 Twelve British Painters, British Council Exhibition at Reykjavik Iceland. 1974 Summer Show One, Serpentine Gallery, London. 1972 Royal Academy Summer Exhibition.